According to NASA, the swirling storm is rotating counter-clockwise over Jupiter’s northern hemisphere. It was captured on October 24, and reveals massive bright clouds and their shadows, stretching roughly 4 to 8 miles across (7 to 12 kilometers). 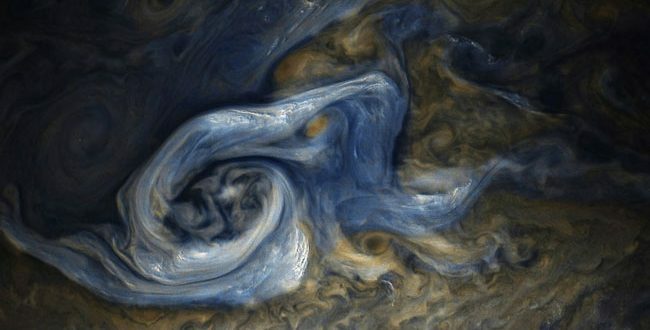 ‘These appear similar to the small clouds in other bright regions Juno has detected and are expected to be updrafts of ammonia ice crystals possibly mixed with water ice,’ NASA notes. The stunning image was processed by citizen scientists Gerald Eichstädt and Seán Doran using data from the JunoCam imager. This phenomenon is a series of eight massive rotating storms on Jupiter. The image was taken on October 24 when Juno was 20,577 miles (33,115 kilometres) above the tops of the clouds of the planet, which travel at about 129,000 mph (60 km/s). The image was taken by Juno on October 24, and was processed and colour enhanced by citizen scientists Gerald Eichstadt and Sean Doran. A ‘string of pearls’ was pictured in the image at 40 degrees south latitude on the gas giant planet. Since they were first spotted in 1986, these white ovals have varied in number from six to nine, with eight currently visible. At the time the image was taken, the spacecraft was 20,577 miles (33,115 kilometers) from the tops of the clouds of the planet at a latitude of minus 52.96 degrees. The spatial scale in the image is 13.86 miles/pixel (22.3 kilometers/pixel).